Definition (MSH) A delicate membrane enveloping the brain and spinal cord. It lies between the PIA MATER and the DURA MATER. It is separated from the pia mater by the subarachnoid cavity which is filled with CEREBROSPINAL FLUID. Definition (NCI) The outermost, toughest, and most fibrous of the three membranes (meninges) that surround and protect the brain and spinal cord. Definition (CSP) outermost and heaviest layer of the meninges covering the brain and spinal cord. Definition (MSH) The outermost of the three MENINGES, a fibrous membrane of connective tissue that covers the brain and the spinal cord. Definition (SNOMEDCT_US) The three membranes that surround the brain and spinal cord, consisting of the dura mater, arachnoid, and pia mater. The pia and arachnoid in combination are referred to as the leptomeninges. Definition (NCI) Any one of three membranes that surround the brain and spinal cord. Definition (NCI_NCI-GLOSS) The three thin layers of tissue that cover and protect the brain and spinal cord. Definition (CSP) three membranes covering of the brain and spinal cord; named the dura mater, pia mater and arachnoid. Definition (MSH) The three membranes that cover the BRAIN and the SPINAL CORD. They are the dura mater, the arachnoid, and the pia mater. Definition (NCI) The delicate, highly vascular, innermost membrane encasing the brain and spinal cord. Definition (CSP) innermost layer of the leptomeninges, which adheres to the brain and spinal cord and conforms to all the irregularities on their surfaces. 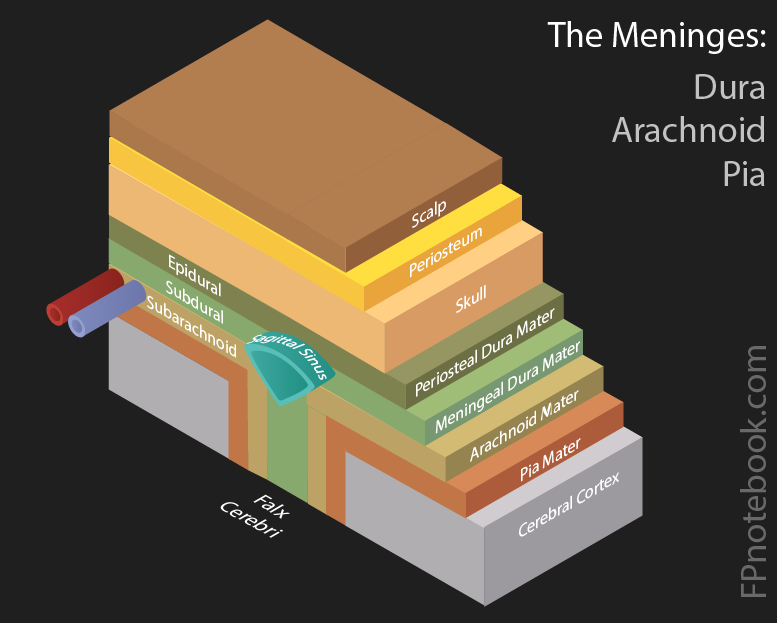 Definition (MSH) The innermost layer of the three meninges covering the brain and spinal cord. It is the fine vascular membrane that lies under the ARACHNOID and the DURA MATER. This page was written by Scott Moses, MD, last revised on 11/20/2018 and last published on 4/6/2019 .